the very tall ground. the olive green alien is 100 feet tall. it is on the ground. he is facing back. the white enormous shiny white sphere is 10 feet behind and 30 feet to the right of the alien. it is 60 feet above the ground. another olive green alien is to the left of the alien. he is 90 feet tall. he is facing back. 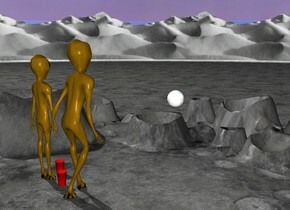 the first humongous red cup is to the right of the alien. another humongous red cup is 12 feet to the left and 6 feet behind the first red cup.